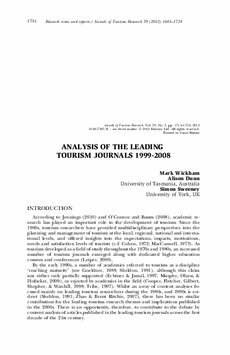 This article aims to examine trends in research themes and outcomes published in the three leading tourism journals from 1999 to 2008. It builds upon previous research relating to tourism publications throughout the 1980s and 1990s, and includes analysis of the practical and/or theoretical implications highlighted by the authors. In order to achieve this aim, a content analysis of 1584 articles published in the three leading tourism journals was undertaken. It was found that during the first decade of the 21st century a consistency in research themes published in the leading tourism journals had emerged, and there was a marked increase in the number of articles providing theoretical contributions to the field. This research supports the contention that tourism continues to develop as an academic field of study.